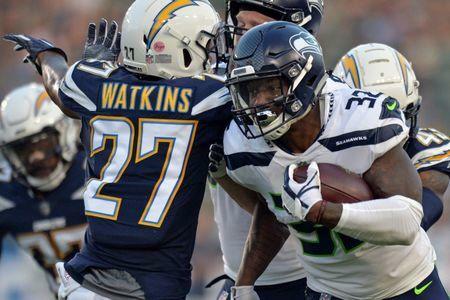 Los Angeles Chargers safety Jaylen Watkins tore his ACL in a Saturday night preseason game, NFL Network Insider Ian Rapoport reported Sunday. Watkins, a backup and special teams player with Philadelphia the past four seasons, was placed on the reserve/injured list. He started on Saturday against the Seattle Seahawks in an exhibition game. Watkins, 26, recorded 17 tackles last season with the Eagles in 12 games (one start). Los Angeles, which defeated the Seahawks 24-14, also is without injured tight end Hunter Henry and injured cornerback Jason Verrett. Henry tore the ACL in his right knee in May. Verrett tore his Achilles tendon on Friday during a conditioning test and also is out for the season.